The British Embassy in Argentina is located in Buenos Aires the capital city. 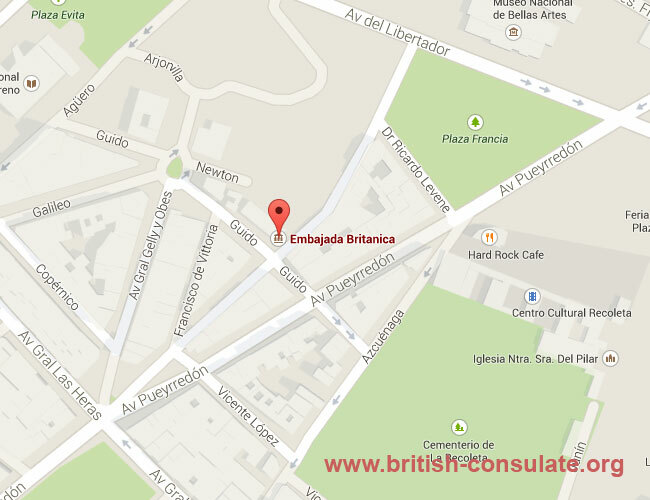 This British Embassy serves the whole of Argentina and issues British Visas if you are in Argentina. We have the telephone numbers listed below as well the the address and a map for the Embassy. Note the times for visa applications are not the same as times for other business activities. The British Embassy will also issue you with a British passport or if you have a son or daughter born in Argentina they will register the child at the British embassy in Buenos Aires. The British embassy in Argentina is closed on Public Holidays and also on certain British Public holidays. It is best to call them or email them for more information. You will also not that they are closed on Christmas and on the National Day of Argentina which is widely celebrated in Argentina. The average visa processing times for people who wish to visit the UK varies for different visas. these applications are listed below and it gives you an idea as to how long you will wait for a British Visa while you are in Argentina. Again, speak to the Embassy staff in Argentina and also ensure that you have provided all the documents needed for your British visa.